Are you a room mom? One the the biggest jobs of the room mom is the classroom party. I’ve worked with teachers that have definite ideas about the party, but sometimes it’s left completely up to the room mom. Planning the party can be hard, especially planning the food! Your school may have rules about what food you can bring. In addition, there may be allergies to accommodate. 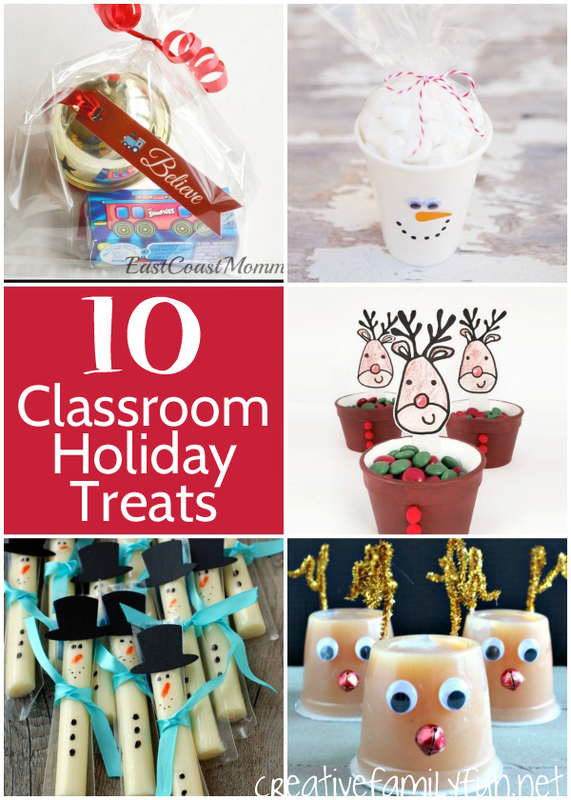 Here is a roundup of holiday classroom treats that all the kids will love and will work with all of the rules that are in place. Make Polar Express Treat Bags from East Coast Mommy. Package up a jingle bell and small packages of candy along with the free printable gift tag. Easy and fun. Simple As That has a fun tutorial to turn paper cups into a snowman, Santa, or a reindeer. Fill these with store-bought treats for a simple holiday treat. You can also turn mini Styrofoam cups into reindeer to fill with store-bought treats. Check out MollyMoo for the tutorial. Do you want something that’s not full of sugar? 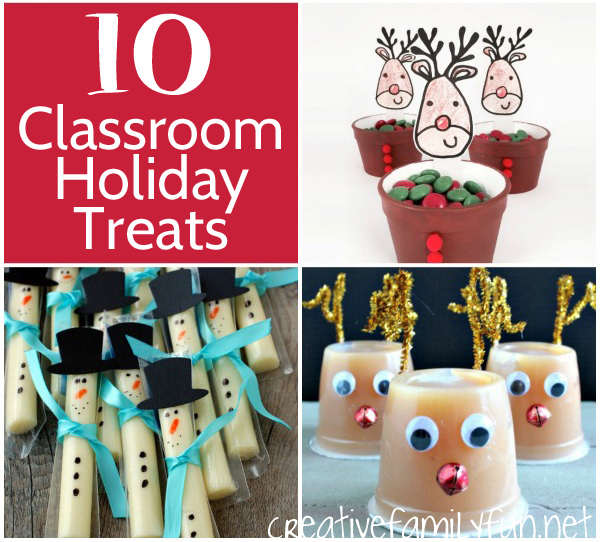 Check out this idea from No Biggie to turn string cheese into cute snowman treats. It’s a quick transformation to turn apple sauce cups into reindeer. Check out this healthy holiday snack idea from The Melrose Family. By far, one of the most popular activities during either of my daughters’ classroom parties is making their own holiday treat. The kids have a blast constructing all the bits and pieces to make their own special treat. Any of these would be perfect to make in the classroom. Special Note: Many of these ideas can still work if your school has a store-bought treats only policy. Most local bakeries will be willing to sell you a batch of undecorated cookies or cupcakes. All you have to do is ask! Then bring along unopened packages of the embellishments. Rudolph’s Snack Mix from Sunshine and Hurricanes is a simple no-cook treat that the kids can construct in the classroom. It only takes a few packages of store-bought treats. Bring along undecorated cupcakes and a few supplies and let the kids make these cute Santa cupcakes from The Joy of Boys. You could also bring the undecorated cupcakes and the kids can turn them into reindeer. Check out Life at the Zoo for the instructions. Buy some undecorated cookies and let the kids turn them into snowman faces. I love this idea from The Joy of Boys. Start with a base of Oreo Cookies, add some embellishments and turn them into reindeer. The kids will love making this Simple Reindeer Snack from Childhood 101. For even more ideas and advice, you can download the Classroom Christmas Party Guide from Pre-K Pages. It’s a great resource. These classroom treats make the job of room mom easy. 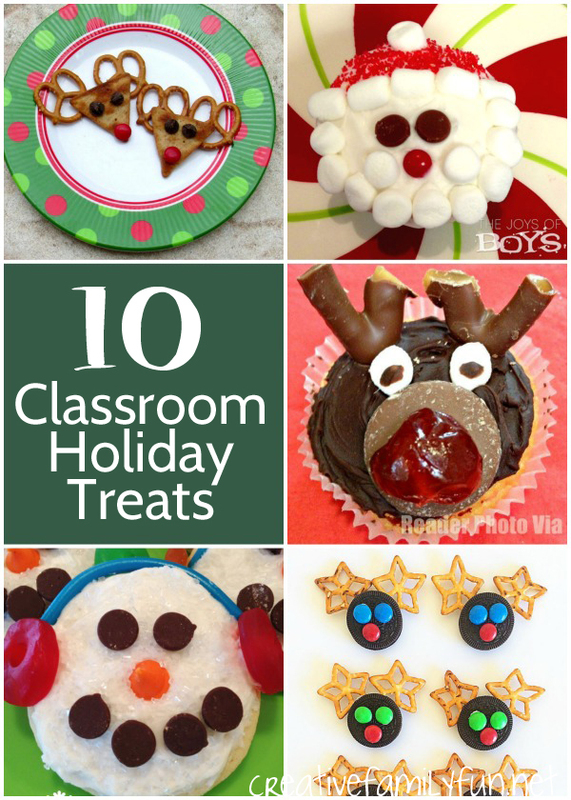 Which one of these holiday classroom treats are you going to bring along to the Christmas party?